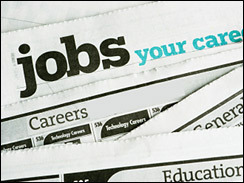 CareerBuilder says unemployed older workers are having a tough time finding jobs. A survey released last week says only 28 percent of workers over 54 laid off in the past 12 months found new jobs compared to workers 25-34 who are quicker at finding work. In that age group, 71 percent found a job within 12 months. As a result, says CareerBuilder, 63 percent of the 55 and up group have applied for lower-level jobs, including entry-level positions and even internships. That’s probably not much of a surprise to recruiters; 37 percent of them told CareerBuilder they have received applications for entry-level jobs from retirees and workers over 50. 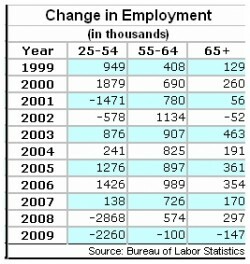 What may well come as a surprise is the rise in older workers and the impact the recession is having on their ranks. Layoffs and job losses have hit the younger workers hardest. According to data from the Bureau of Labor Statistics in the 18 months since January 1, 2008, the number of workers in the 25-54 age group has declined by 5.1 million. For workers over 54 though, there are 624,000 more working. In fact, there were gains in the number of older employed workers in every age group the BLS tracks except one — 55-59 year olds who saw a modest decline of 79,000 in the 18 months. Before you point out that the sheer number of older Americans has been rising, which is certainly true, consider for a moment the participation rate. Based on a monthly survey conducted by the U.S. Census for the BLS, the participation rate is independent of population size. It describes the percent of various population groups in the labor force. The data shows that for the last 10 years, more and more older Americans are working. Since 1999, the percent of working Americans 55-64 has grown by 10 percent, while the over 64 age group has jumped — and that’s an apt word — by almost 40 percent. Contrast those changes to the 25-34 year olds who have declined from 84.6 in 1999 to 82.9 percent for the six months ending in June. 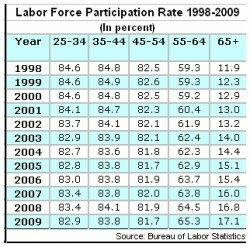 In the 61 years for which the BLS has data, this many older Americans have never been employed. In the mid-50s the percentage began to rise until 1967 when, at the peak, an average of 62.3 percent Americans aged 55-64 worked. The percentage began to decline until it bottomed in 1986 at 54 percent of the age group working. There it remained, rising modestly until the recession of the 90s when it started its upward climb. Even more dramatic has been the number of those 65 and over reentering the workforce. For years, between 11 and 12 percent of retirement age Americans have worked. In 1998, on average, 11.9 percent of the 65 and over group worked. In June, it was 16.8 percent. The explanation for the uptick in older Americans working is not too difficult to guess at: Longer life spans, better health, and access to health insurance whether private or through Medicare, the decline of the defined benefit pension coupled with the increase in the Social Security age, and, in the last two years, the recession, which has devastated many workers 401(k)s.
The implications, however, are harder to forsee, as is deciding if this is a structural change in the American labor force or a temporary economic blip. A BLS economist told me a colleague of his is researching these very questions. 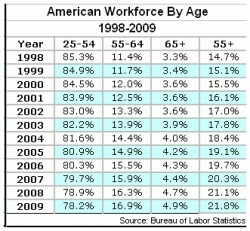 Regardless of the cause of the return to work by older Americans, there’s no denying the graying of the workforce. For the first six months of this year workers 55 and over accounted for 21.8 percent of the labor force. That’s the highest percentage since 1971. Meanwhile, the percentage of 25-34 year olds has taken a nose dive. From a high of 36.6 percent in 1986, the percentage has dropped 11.5 points to 25.1 percent for 2009. For the 25-54 year age group as a whole, there’s been a decline of almost eight points since 1993, when 86 percent of the workforce fell into that age group. For the first six months of 2009, 78.2 percent do. Consider now the demographic factors we’ve detailed: an aging workforce, reentry into the workforce by workers who in years past would be retired, lower workforce participation by workers in the entry-level age group of 25-34, and, finally, the sheer reduction in employment by that age group caused by layoffs and other factors. The implications of this are immense for employers and recruiters. Among them is the increase they are seeing in mature workers seeking jobs. That 37 percent of recruiters who told CareerBuilder they’ve received applications from mature and retired workers for entry level jobs is, therefore, not that much of a surprise after all. Even though the CareerBuilder survey says 65 percent of the employers report being willing to consider overqualified candidates, the reality is probably closer to the 44 percent of mature workers who say they’ve been told they are overqualified. Recruiters who reject overqualified mature workers may find it increasingly difficult to find the young workers who might otherwise take those jobs. Should recovery from the recession prove to be as long as some economists are now fearing, retirements will continue to get pushed off and retirees with diminishing payouts from their 401(k)s and other savings will reenter the workforce at an accelerating pace. Evidence of the former is in the CareerBuilder survey. One in five employers report being asked by employees to postpone retirement. Most of those employers (86 percent) said they would consider it. If the demographics are any guide, 100 percent may come to wish they did. As with many small business owners, I belong to a number of online social networks including Twitter and Facebook. I frequently review postings from other members to identify interesting information that I believe will be of value to my target customer, small business owners. Commuting in our area is grueling, and after leaving the “rat race” seven years ago to start my own business, I thought I had found a way to truly control the time I spend in my car. I opened a doggie daycare, Dogtopia, just seven miles from my house. Our business hours had me commuting outside of the most congested periods of the day, and I felt that I had solved the problem. No longer would I be subjected to hours of wasted time in my car. Until I decided to expand the business, that is. A few years later we decided it was time to grow Dogtopia. We had great success with the first dog daycare franchise in Tysons Corner, VA and felt it was time to add a “sister store” in North Bethesda, MD. The new Maryland store would be only 14 miles from the Tysons Corner location – an easy commute between the two. Or so we thought. Apparently, the Wilson Bridge that takes you over the Potomac River and from Virginia into Maryland, had other ideas. Skip forward a few more years and we are now a growing franchise company with 20 locations across the country. We also have over 30 employees, six of which are in franchise management and report daily to our North Bethesda location. The North Bethesda location now houses our national headquarters and training center. Since we began the business in Virginia, that also happens to be where the majority of our corporate staff lives, thus the daily undertaking of the Wilson Bridge. The result, I was back to where I started eight years before and dealing daily with the horrors of DC traffic! The first two are quite obvious; the third requirement is because even when in the office, I often use IM to communicate with my team. I might have a quick question while on the phone with a vendor or franchisee and it prevents me from having to yell and/or put the person on hold. Our initial ‘Flexible Fridays’ program last Summer worked great! Knowing they had at least one day per week where they could avoid traffic really improved the outlook of the staff, and I know they appreciated my gesture. There have been a few frustrations, but the slight inconveniences are more than outweighed by the increased satisfaction felt by my staff. This year I decided to once again offer ‘Flexible Fridays’ and so far, so good. Other times of the year it would not be possible due to franchisee training and other commitments, but it has become a nice Summertime perk, and one that I plan to continue indefinitely. It’s no secret that every business today, regardless of sector, is faced with tough financial decisions. To that end, how do companies retain employees when budgets are impacting salaries and benefits? On one hand, management might take the position that with uncertainty in the marketplace, employees, despite reduced compensation packages, will stay in a job no matter what. That’s the short side of the argument. The larger picture is that the economy is sure to rebound and employees have long memories. One approach is to provide meaningful benefits coupled with real assistance for all employees in an effort to aid retention and provide for an enhanced quality of life. When faced with a competitive marketplace, the demand for highly skilled workers in a particular industry such as health care is fierce. The most cost-effective and efficient strategy is to hire the best employees during the recruitment phase and retain them for as long as possible by offering benefits that will enhance their quality of life. These quality of life benefits encompass several areas and include financial assistance, health and well-being and work-life resources. In addition to wages, perhaps your organization may allow employees to “assist” co-workers that are facing a difficult financial situation. If your organization is a nonprofit and has a foundation or charitable affiliation, consider whether or not a special employee-fund can be established. Annual or any time contributions can be made and “drives” such as a cookie, flower or the like can generate thousands of dollars. Another way that employees can assist a co-worker in need is through the donation of Paid Time Off (PTO) hours. This is especially useful when an employee is experiencing a serious medical condition and has exhausted their own PTO hours or if they need income for time off. Large organizations should take advantage of the purchasing power of a big group through discounted services and coupons offered by national retailers and service industries. For example, employees might receive a 15 percent discount when using an on-campus or nearby daycare provider. Employees might be eligible to receive 20 percent off tax preparation services by a nationally known tax preparation service. Other reduced costs can be negotiated for employee entertainment such as amusement park fees and movie theatres. Most employers are well aware of continually rising health care costs. Disease prevention and fitness opportunities not only benefit the employee, but healthy team members use less health care services and costs can be better managed. Consider partnering with a local fitness center and offer free or discounted memberships, not only a great benefit, but also a great way to contribute to the bottom line. Employees are people with lives outside the workplace. To ensure productivity and peak performance, offering a free employee assistance program (EAP) when someone needs guidance, counseling, referrals to local services or reliable professional care is often money well spent by the organization. Services include emotional health counseling and referrals, financial consultation including budgeting, credit assistance and college or retirement planning. The EAP also provides legal services including consumer and family law situations, traffic citations and estate planning. Going beyond a paycheck can help make a difference in an employee’s life. What can your organization provide to enhance the lives of workers? For instance, consider offering all employees interest-free loans for the purchase of a personal computer. The incentive is that many employees in a large manufacturing firm or service organization may not have access to a personal computer on daily basis. As more communications and employee activities become electronic it becomes even more critical to offer ways to “wire” staff members to the organization. Partnerships with banks or credit unions are also desirable for employees who can take advantage of the option of checking and savings accounts as well as automatic payroll deduction for home and auto loans. Helping employees hone skills that might be outside their normal job duties is also a great idea. Consider partnering with a local community or business college to offer staff free office software classes such as word processing, spreadsheet and presentation software. The lifeblood of any business is its workforce. Today’s leaders must recognize that without talented, highly skilled and dedicated workers, many organizations would merely be buildings with equipment and furniture. Therefore, the best investment we can make for the future is the investment of a compensation package that provides employees with useful and meaningful benefits that enhance their quality of life. Darla Mullner is human resources director at Rush-Copley Medical Center in Aurora, IL, a 183-bed hospital providing health and wellness services to the greater Fox Valley community. Rush-Copley was named one of Chicago’s 101 Best and Brightest Companies to Work For in 2008. Mullner can be reached at dmullner@rsh.net. Strategic Growth Concepts is pleased to present articles from time-to-time written by Human Resource related experts. Our first article is from LaToya M. Palmer, an HR professional with over 10-years of extensive experience in all aspects of Human Resources. She is President of the Michigan-based consulting firm, Palmer Solutions, LLC., which specializes in innovative HR solutions while also providing creative benefit management and payroll administration services. Many small to mid-size companies are ‘battening down the hatches’ during these economically tumultuous times. Major cost cutting efforts, re-organizations and layoffs are foremost on their lists of things to do. Unfortunately, employee retention in smaller organizations often times takes a back seat to financial concerns, mainly because business owners, already cash strapped, associate retention efforts with cash. They are so busy watching the company’s coffers that they have taken their eyes off the most valuable asset, human capital. Employees are getting lost in the shuffle at many companies when it comes to retention. Employers are counting on the fact that due to the turbulent economy, employees are “lucky to have a job.” This may be true, however ‘when times start a’ changing’ these companies are going to experience a mass exodus of their top talent going right out the front door. Those forgotten stalwarts that were the bedrocks during the down times will be the trailblazing their way to companies that believe in retaining their top talent. Communication: There is no such thing as too much information. You should be communicating to your employees in a constant regular stream. In our technologically advanced society, you can be cutting edge and use things like Twitter, blogs or your internal company website to keep employees informed about the business. There is also still credence in company newsletters and employee meetings. Utilize different touch points to let your employees know that you want them to have a stake in what’s going on in the company. Employee Surveys: Companies should not be waiting for exit interviews to find out if there is a problem in their organization that needs to be addressed. By conducting semi-annual pulse surveys, and having strategic plans to make use of the information, companies will actively show employees that they value their opinions. Reward Employees: Many of you are sighing after reading the “reward your employees” header. Don’t sigh just yet. There are many ways you can reward employees without necessarily spending boatloads of money. So many, in fact, that people have written many books attributed to celebrating employees without spending much money. A few titles that stand out are: “1001 Ways to Reward Employees” by Bob Nelson, Ph.D; “301 Ways to have fun at work” by Dave Hemsath; “Managing to Have Fun: How Fun at Work Can Motivate Your Employees, Inspire Your Coworkers, and Boost Your Bottom Line” by Matt Weinstein. You want your employees to be at your company because they are treated as stakeholders. Keep in mind, as business owners, for the long-term it helps our profitability to show our employees that they are valued through our actions and with our words, and translates to bottom line growth with low turnover rates and high marks for employee satisfaction.